How To Measure Your Property? How do I measure my home and property, so a Landscape plan can be drawn? It is easy, but it is important that that measurement and details are accurate. The better the site details but the better the final Landscape Design will be. The picture below shows many of the measurement that should be made. Take the necessary time to do the job right. Good Luck!! 1. Let's begin at the left corner of the property at the street and measure down to the driveway edge. 2. Then continue to the nest edge of the driveway. 3. And on to the lot corner Again make sure you write down the measurements as you proceed along. 4. Turn the lot corner measure down to a point straight out from the corner of the house. 5. Continue to the next corner of the house as shown on the plan. 6. Proceed to the lot corner and proceed to the next corner. 7. Now we will go back to where we started at the street and measure up to the back corner of the house to the front corner where you started. Now, you are ready to measure the House. Start at the left corner, proceed to the edge of the first window to the other side of the window and to the corner. Continue taking measurements all the way around the house including the driveway, walk, patio and from the corners of the house over to your property line. Make sure you have written down all of the measures as you proceed around the property. Now you might ask, how do I locate the trees present on the property. From the corner of the house, straight out to the street make sure you have the tape lined up at the same angle as the side of the house. Lay the tape down on the ground, go back to where the first tree lines up with a mark on the tape and that is the measurement that you write down. Now at a right angle, measure over to the tree. Now proceed down the tape to where it lines across to the next tree and over to the tree. Go to the back corner of the house and repeat doing the same thing Measuring the tree location and any other existing items. 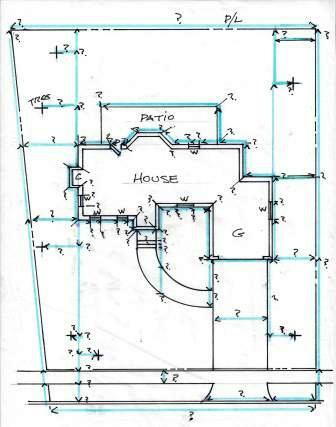 After you have all of the measurements as shown on the drawing you are ready to draw your landscape plan using a scalke of maybe 1" = 10' or on a small lot maybe 1/4" = 1'. my creative designers what they need to create a "Master Landscape Plan". You and your family will enjoy, a great relaxing time together in the beautiful surrounding of your home.